.> View photos from the 2018 CCBWA. “A crowd ignored light rain Sunday to greet the arrival of Santa Claus during the Antietam Valley Community Partnership’s tree-lighting ceremony at Carsonia Park.” Read the full Reading Eagle article. 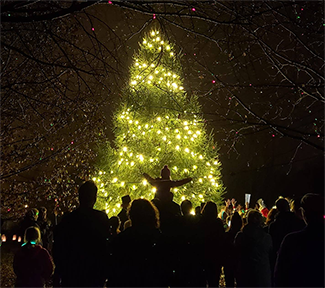 >> Read more about the 2018 Tree Lighting in the Park. Since the Antietam Valley Community Partnership was founded, it has been working to build community spirit and a better quality of life in an area of Mount Penn, St. Lawrence and portions of Exeter and Lower Alsace townships. >> Read the Reading Eagle Editorial. Again this year, AVCP is offering four $500 scholarships to high school seniors living in Mt. Penn Borough, Lower Alsace Township or St. Lawrence Borough. The focus of the scholarship is community service. Also, the Kerry Hoffman/Antietam Pride Scholarship is available to Antietam High School seniors who have demonstrated pride in the Antietam School District. The deadline for submission of both applications is Friday, April 12, 2019. Finalists will be invited to interview with the AVCP scholarship committee. Interviews will be held in the Antietam district office. Save your completed application and email/mail to Larry O’Boyle at larsuso@aol.com or P.O. Box 3616, Reading, PA 19606. FARMERS’ AND ARTISTS’ MARKET RETURNS! Our Farmers Market will continue with two remaining Monday evening dates on April 15 and May and May 20. The 2019 Summer Market will be held on Mondays from June 3 through August 26 from 5-8 pm. Join your neighbors as we welcome back some favorite returning vendors, along with some exciting new ones!